As summer draws to a close and a new school year begins, keep the kids’ (and your!) spirits up with an evening of Feasting, Fighting & Family Fun! 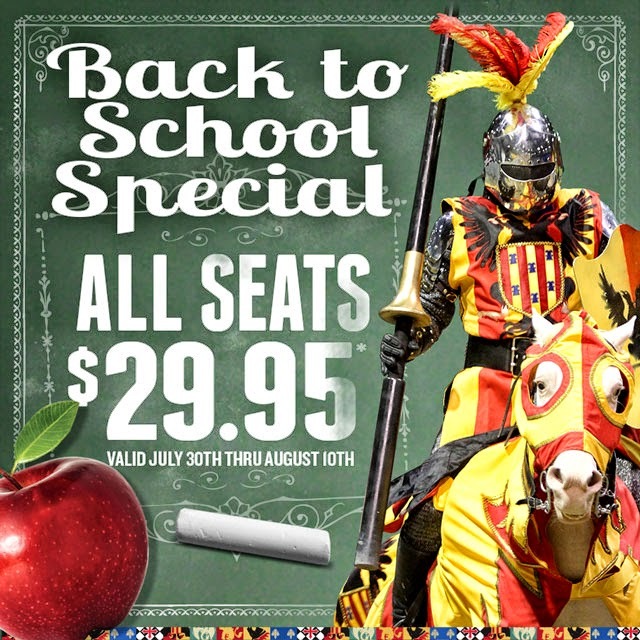 Now through Sunday, August 10th, all seats are just $29.95 as part of Medieval Times Atlanta’s Back to School Special! Ring in the new school year with jousting knights, damsels in distress, a free-flying falcon, and an abundance of medieval pageantry. We have been to Medieval Times on several occasions and we love every minute of it. The show is spectacular, high energy and very entertaining. Galloping stallions, knights jousting and battling good vs. evil, Medieval Times is perfect for the whole family. The food is fit for a king. The bill of fare is quite substantial and if you are a vegetarian you can always order a vegetarian meal. Kids love coming to Medieval Times because it is one of those places that lets them be transported back in time. Is not the same watching knights fight on the TV vs real life. The show at Medieval Times is a show with outstanding showmanship that will let them screaming at the top of their lungs. Visit http://bit.ly/29BTS for more information and to book your tickets today! Medieval Times Atlanta is giving away 4 Tickets for Dinner and Tournament to one lucky Bluebird Patch reader. To enter tell us who would you love to take with you and register your entry on our widget.